Finally tourdates and boxset release announced! YAZOO - Vince Clarke & Alison Moyet - have announced that they will reunite for the first time in over 25 years for Reconnected, a UK tour in June, starting in Glasgow on the 4th and culminating in a headline show at London’s Hammersmith Apollo on the 18th. There will be an exclusive on-sale opportunity at www.alisonmoyet.com beginning 25 January for one week only. General on-sale begins 1 February. The tour is preceded by In Your Room a 4 disc box set which includes remasters and 5.1 mixes of both Yazoo’s classic albums ‘Upstairs At Eric’s’ and ‘You And Me Both’, b-sides and remixes and a DVD featuring a new short film containing exclusive new interviews with Vince Clarke and Alison Moyet and the promo videos for Don’t Go, The Other Side Of Love, Nobody’s Diary, Situation (1990) and Only You (1999). The joyous, unlikely coming together of Vince Clarke, who had just left Depeche Mode, and Alison Moyet lasted for only 2 albums, saw them performing only 24 concerts worldwide, but left an indelible mark on pop. 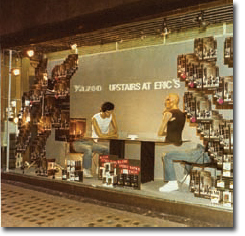 Yazoo released ‘Upstairs At Eric’s’ in July 1982 then parted company just 12 months later on release of the second album ‘You And Me Both’, which reached Number 1 in the UK. Vince and Alison have since gone on to have their own successful careers, Vince with Erasure and Alison as a solo performer, both releasing critically acclaimed hit albums in 2007. The Reconnected Tour will also see Yazoo perform material from ‘You And Me Both’ for the very first time as well as pop classics Only You and Don’t Go.